John Schlesinger’s celebrated slice of sixties British New Wave makes its debut on Blu-ray this week, and remains an absolute must-see for all serious cinephiles. Although lumbered with the ‘angry young men’ label back at the time of its release, Billy Liar (1963) actually eschews that kitchen sink realism and remains a quirkier beast than its cinematic brethren. Schlesinger (who would go on the even greater success with 1969’s Midnight Cowboy) exhibits a disarming exuberance and playfulness behind the lens, and it’s a film which crackles with an energy and imagination that completely betrays its half-a-century age. In a timeless tale of youthful fantasising and wish fulfilment, 19-year-old Billy Fisher (a vivacious Tom Courtenay) harbouring dreams of becoming a celebrated in-house writer for a famous comedian. He longs to escape his lacklustre working-class life and thankless job as a clerk for the local undertaker and make a break for the bright lights of London. Billy is also prone to wild daydreams in which he is the ruler of another, faraway land, but his fervent imagination threatens to be his undoing. It causes him much trouble with the various women in his life, and is an on-going source of annoyance for his principled, authoritarian family. An anarchic streak runs throughout the film, and this undoubtedly signalled (and even foreshadowed) the rebellious youth movement which would soon offer an irrevocable change in social attitudes and behaviour of the time. When Billy hilariously imagines gunning down his disapproving parents and grandmother with a machine gun, it could almost be a scene plucked from any contemporary, satirical coming-of-age yarn. Courtenay’s tour-de-force performance is an absolute joy to behold, and while he didn’t hit the heady big screen heights of his contemporaries like Terrance Stamp and Albert Finney, he’s utterly mesmerising here. The film is also renowned for putting Britain’s cinematic sweetheart, Julie Christie, firmly on the map. Despite a meagre screen time, she is also terrific as the free-spirited object of Billy’s affections, and she showers the film with a warmth and believability whenever on screen. Always found hovering around the top whenever a poll crops up for the greatest British films of all time, the unbridled love for Billy Liar is entirely justified. It’s an undisputed classic, and now a new generation of fans are in for a treat via this peerless digital transfer. 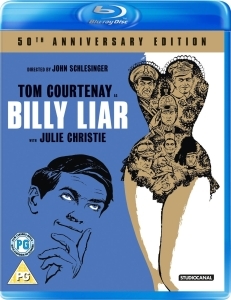 Win a 50th Anniversary Blu-ray copy of Billy Liar with our latest competition. Follow this link to enter.